Apricot launched their first vessel in 2014. However, the foundations of the company were laid a few years ahead with the building of the bridge linking Tuan Chau Island to the mainland and the ensuing possibility to bring passengers to a private pier, a service never yet offered by cruise companies of Halong Bay. Apricot Cruise furthermore used all their artistry to revolutionize the world of three-star Cruising late December 2014 when launching the Golden Sun Cruise, an utmost luxury vessel whose qualities go far beyond the most extravagant imaginations. 07:45 – 08:30: Our guide will meet you at your hotel. The shuttle bus or private car pick up. Enjoy the peaceful scenery as we travel through the countryside, farmlands and Red River delta. 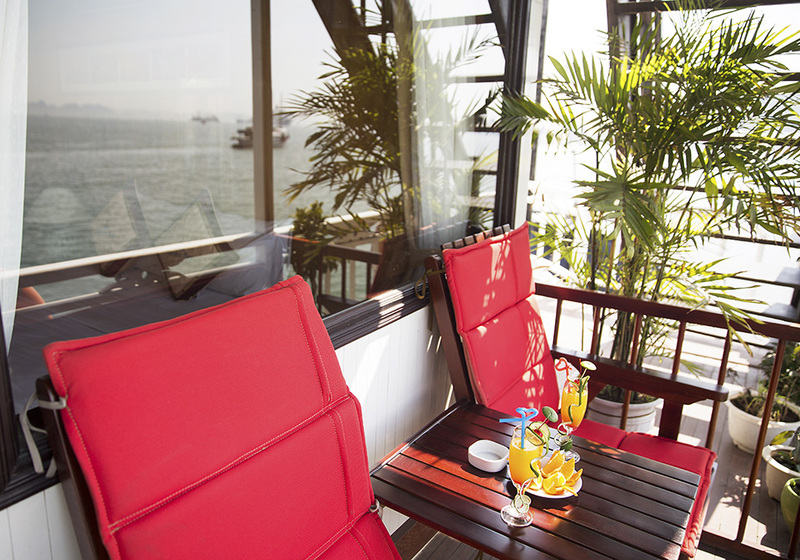 12:00 – 12:30: Arriving Tuan Chau Marina.Welcome aboard the cruise. Meet the captain, crew and join us for welcome drink as we tell you about life onboard. Climbing up to the Top of the Island – take the best view of Halong Bay in the Summer time. Continue cruising to the quiet area while enjoying beautiful seascape on the way. After that, come back to the boat, enjoy the Sunset Party on the sundeck (free wine & fresh fruits). Evening Relaxing: Dinner is served. 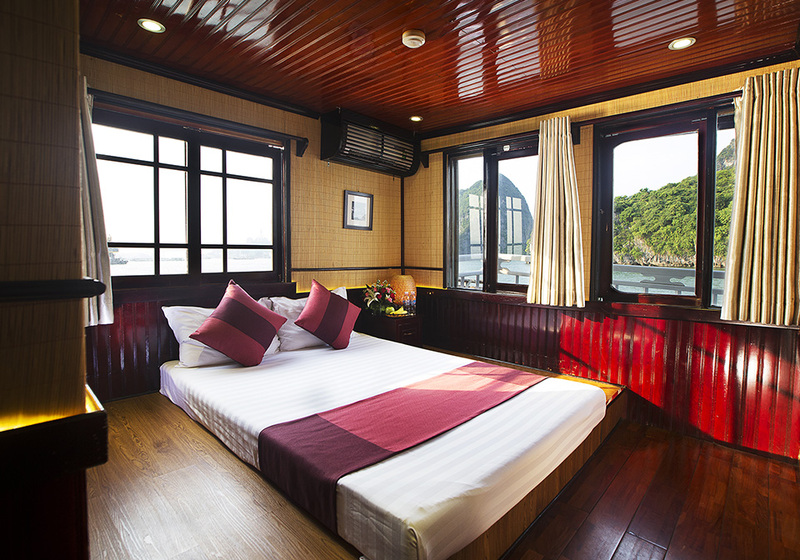 Socialize with other guests, take part in board games, fish for squid, or just laze around. 07:00: Have breakfast on board while the boat starts cruising to the Natural Preservation Zone. Do Kayaking in 30-45 minutes. 09:30: We board the cruise again. Take time to refresh and relax before checking out. Bags can be left in luggage store. 11:30 – 12:00: Disembark at the harbor, Tuan Chau Marina. 12:00 – 12:30: Arriving Tuan Chau Marina. Welcome aboard the cruise. Meet the captain, crew and join us for welcome drink as we tell you about life onboard. 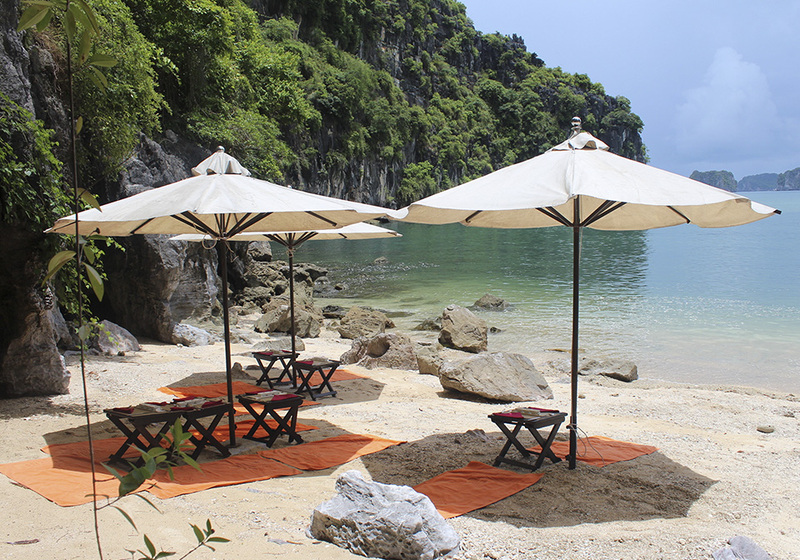 Explore the Sung Sot Cave – the most beautiful cave in Ha Long Bay. It is one of the widest grottoes in Ha Long Bay with thousands of stalactites and stalagmites. 06:00: Start your day with Taichi exercises or a photo hunt. 08:20: The tour guide will pick you up at the Apricot cruise transfer to Daily boat. 09:30: Visit Dong Tien Lake in 30 minutes. 10:00: Do kayaking in Trong Cave. 11:00: Jumping from the boat to swimming around the boat in 30 minutes. 12:45: Have lunch on boat. 14:30: The boat brings you to Pearl Farm Village to learn the technique for making high quality pearls. 15:30: We have small sunset party with free Vietnamese Coffee and tea. 16:20: The tour guide will bring you back to Apricot cruise, you will have free time to enjoy the sunset party (free wine and fresh fruit) at 6:00 pm on sundeck for relax and make friend with the new groups. Then, Socialize with other guests, sing karaoke together, fish for squid, or just laze around. 09:30: We board the cruise again .Take time to refresh and relax before checking out. Bags can be left in luggage store. The dining venue on board brings you the taste of local Vietnamese luxury’s cuisine. All rates do not applied on Dec 24 & Dec 31, 2019 & Lunar new year.